One of the most famous phrases of early American history is “Millions for defense, but not one cent for tribute.” This phrase grew out of negotiations that the young nation of the United States attempted to carry out with France in order to avoid war. The French diplomats agreed to commence negotiations, but only if they were paid personal bribes in advance. The phrase is attributed to Robert Goodloe Harper, a South Carolina Federalist and Chairman of the United States House Ways and Means Committee. As a student of history, this memorable quotation comes to mind in analyzing how 7-Eleven, Inc. and its publicly held parent corporation allocate the available capital that they have to invest in the business. In a system where, in return for surrendering in many cases more than 50 percent of the gross profit of business, the franchisees are relieved of any obligation to make capital expenditures, they are nevertheless keenly interested in how these decisions are made. And there is little reason for franchisees to be pleased with the way capital is being allocated. The blockbuster deal—which has not yet closed—to purchase more than 1,100 gasoline stations from Sunoco for $3.3 billion is only the latest, but by far the largest, example of an immense capital commitment from Seven & I Holdings. By the time that deal closes, the parent company of SEI will have spent more than $6.1 billion on business acquisition costs since 2012. It is very apparent from reviewing their financial statements that the parent corporation has placed a very large bet on the future of SEI in the United States based on this deal alone, which will result in a substantial expansion of the system and a further elevation of the prominence of gasoline sales in the product mix. In fact, over the last seven years, the gross margin contribution derived from gasoline by SEI has grown at twice the rate as the gross margin contribution it receives from franchised stores. The size of the bet is demonstrated by the fact that the percentage of the total capital expenditures of the parent corporation devoted to SEI will rise from 28 percent in 2016 and 38 percent in 2017 to 63 percent in 2018. This wager is also driven by the fact that the stock of the parent company has consistently underperformed all of the indices. Over the 52-week period immediately prior to the National Coalition’s July 2017 convention, the stock of the parent corporation had declined by 7 percent, while the Nikei Index was up 25 percent, the NASDAQ up 23 percent, and the Dow up 17 percent. But the bad news for franchisees is that the percentage of the capital expenditures of SEI devoted to existing stores fell from 47.6 percent in 2015, to 29.9 percent in 2016 to 22.2 percent in fiscal 2017. This tells us that billions are being spent to purchase stores and gasoline assets and pennies by comparison are being spent modernizing, upgrading, refurbishing and generally improving existing stores, which are now 87 percent franchised, up from 80 percent in 2013. The rationale for that trend is clear from reviewing shareholder communications issued by the parent corporation, which point to a direct correlation between the increase in the ratio of franchised stores and the increase in gross profit from operations realized by SEI. This trend will accelerate when SEI eventually begins to franchise the Sunoco stores it is acquiring. Dating back to 2011, SEI and its parent have engaged in a virtual spending spree, acquiring two convenience store chains (Tedeschi and Valero) and making five other gasoline acquisitions, including retail operations, wholesale fuel dealer businesses and fuel supply arrangements. 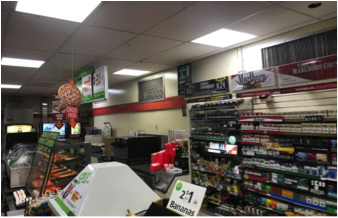 The numbers tell a very effective story about how franchised stores are being starved of needed upgrades and improvements, but a few pictures can tell the story much more effectively. 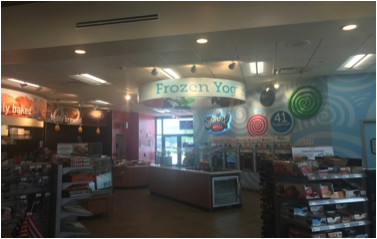 These pictures were provided by a franchisee who, for obvious reasons, shall remain nameless. Competition faced by SEI franchisees is getting more intense all the time and new, gleaming, modern, colorful and well-lit stores owned and operated by well-financed competitors are popping up all over the country. 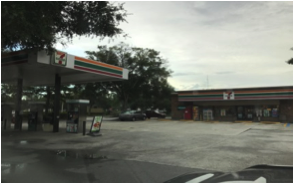 Here is an exterior picture of a particular 7-Eleven store. Here are some exterior shots of a nearby Race Trac which directly competes with that 7-Eleven store. 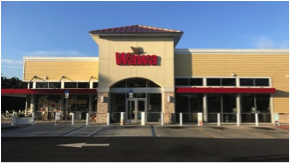 And here are some exterior shots of a nearby Wawa. 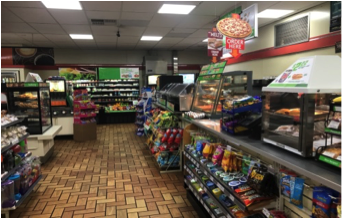 You do not have to be a financial analyst or a marketing genius to understand the competitive challenges faced by the 7-Eleven store in this particular market. 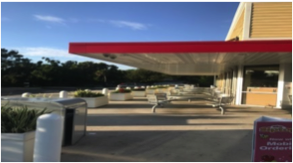 The Race Trac and Wawa exteriors are modern, sleek, open and inviting. Franchisees tell me that this is quite typical of what increasingly confronts them in their markets. 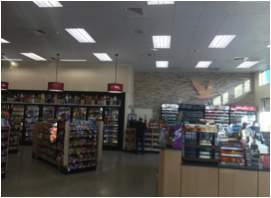 Here are two pictures of the interior of the same Wawa store. Notice the bright colors, the high ceilings, the clerestory windows and the spaciousness of the aisles. 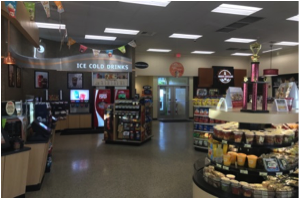 Here are pictures of the interior of the same Race Trac store. Notice the high ceilings, bright colors, extensive lighting, clever graphics and the uncluttered nature of the interior. 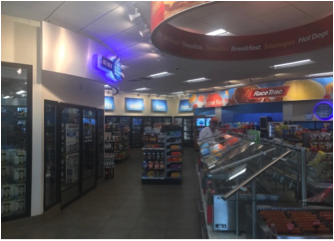 And here are pictures of the interior of the above-pictured 7-Eleven store. The store looks like it hasn’t been touched in decades, the ceilings are low, there is no natural light and the store appears cluttered and tired. We harbor no illusions about where decisions concerning capital expenditures on SEI existing stores are made. This means that the National Coalition, its constituent franchise owners associations and their member franchisees need to have a perspective that goes far beyond Dallas. This is why we continuously monitor the communications, financial statements, stock performance and regulatory filings of SEI’s parent company. It also means that the franchisee community, more so than at any time in the 40-year history of the National Coalition, needs to remain united, cohesive and determined in its efforts to obtain renewal franchise agreements that reflect a fair and equitable balance of the risks and rewards of this franchised system. That agreement must contain fixed, binding and generous obligations for capital expenditures to make up for lost time by upgrading stores on a fixed schedule to which SEI is held accountable so that 7-Eleven stores can someday be as modern, light filled and inviting as the competition.